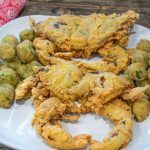 Fried Soft Shell Crabs are flavorful and fried to a golden brown crispy perfection. Thaw and clean soft shell crabs. Heat oil in a deep fryer to 350 degrees. Make a milk bath with the milk, mustard, and eggs. Whisk together in a bowl. In a separate bowl mix together the flour and Slap Ya Mama Fish Fry or your favorite fish fry. Coat the crabs in the flour mixture, dip the crabs in the milk bath, then back into the flour mixture again. Place crabs one at a time legs first into the oil. Cook each crab 2-3 minutes or until golden brown. Carefully remove and place crabs on a wire rack or cookie sheet lined with paper towels. Using a wire rack keeps the crabs crisper than using paper towels. Note- the nutritional label below does not include the 5 cups of oil used for frying the soft shell crabs. * See my tutorial on How to Clean Soft Shell Crabs.